[prMac.com] Hagenberg, Austria - Ergonis Software today announced the release of Typinator 3.3, the latest version of its highly acclaimed tool for auto-typing text and auto-correcting typos. The new version adds predefined sets with subscript and superscript characters and separate auto-correction dictionaries for US and British English. It thus comes with a total of 10 predefined abbreviation sets for system-wide auto-correction for three languages, HTML coding, FileMaker development, and more. Typinator 3.3 also allows to define set-specific options, where users can conveniently specify common prefix and suffix characters for all abbreviations within a set, define separate expansion sounds and add notes per set. Finally, the new version includes a number of other improvements and fixes, including increased compatibility with Adobe Acrobat. "The current version of Typinator comes with a total of more than 8000 snippets in ten predefined sets. This makes Typinator a guaranteed productivity booster right out of the box, even without defining any own snippets," said Christoph Reichenberger, founder and CEO of Ergonis Software. "And the new set-specific options are great for customizing your snippet sets. Whether you want to assign a custom expansion sound or add a common prefix to hundreds of snippets - all this is now a matter of just a few clicks." Typinator 3.3 requires Mac OS X version 10.4 or newer, Mac OS X 10.5 (Leopard) is recommended. Visit Ergonis Software's website to learn more about the changes in this release and to download and try the new version. Typinator can be purchased securely on the Ergonis Software website. 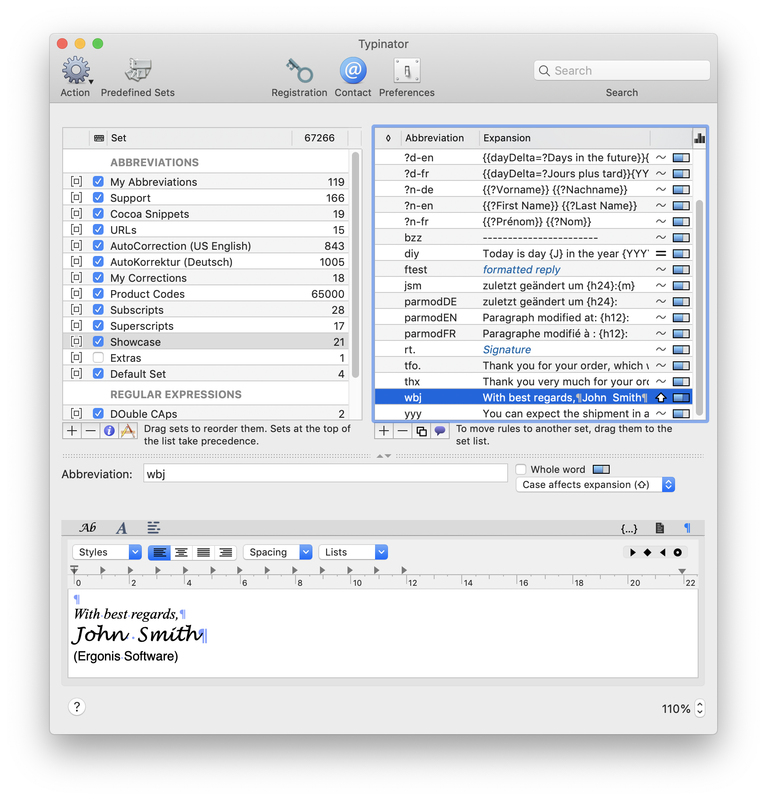 The upgrade to Typinator 3.3 is free for all customers who purchased Typinator in the last 2 years. For information about purchases, including enterprise licenses, volume discounts, and upgrade pricing offers, see the company's web site.